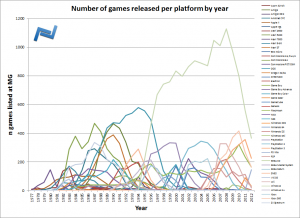 Taking data from MobyGames I have analyzed their information on games released since 1977 on many platforms in an attempt to make some historical sense of it all in a descriptive way. It is entitled MobyGames: Quantify Me. A brief quantitative analysis of the gaming era according to MobyGames. Below is the Abstract plus some key figures, but you are encouraged to read the full article here: MobyGames: Quantify Me 2012. Enjoy the read! Introduction. MobyGames (MG) is the self-acclaimed “most accurate” database on the internet that documents computer games released on all known platforms. There have been many gaming platforms throughout the past decades, since computer games started to surface in the late 70s. Given the notion that the number of games released for a platform equals its success, it is of some interest to examine the number of games released for each platform in time. 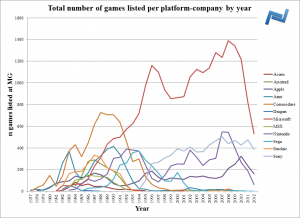 Thus, if the number of games listed at MG is in some way representative of the actual games released in our world, we may take a look at history and shed some light on the dynamics of game platforms in time. Of particular note, it might be possible to determine the importance of each platform and gain an estimate of their success. Methods. MG publically lists all the games in their database, with game title, platform, publisher, and year of release as relevant variables. A selection was made of all platforms listed there and excluded specific platforms not relevant to the current analysis (i.e. 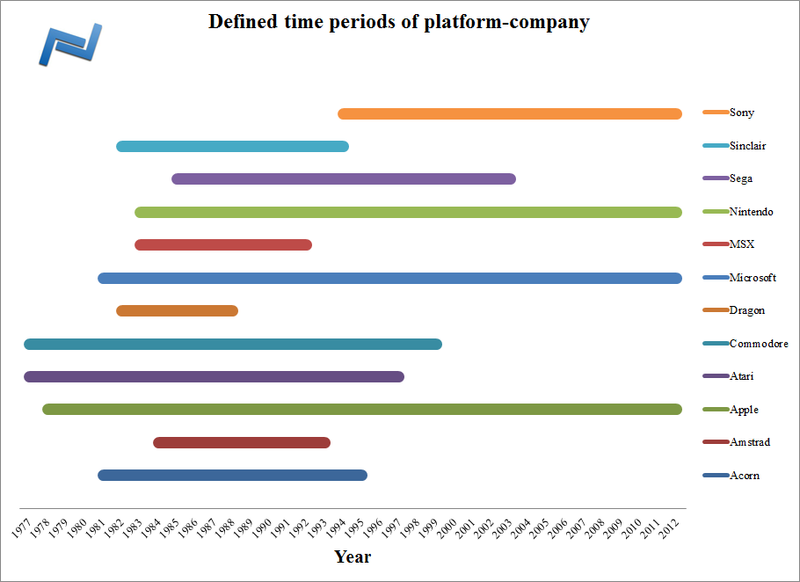 platforms specifically only used in one or very few countries). The following variables were obtained for each game listed there: platform, year of release (according to MG), publisher. The data were fed to SPSS 20.0 for further statistical analysis. Descriptive statistics were used to present the data. Duplicate game titles were identified by exact comparison of titles listed at MG. Unique game titles were ranked to the entered year of release. The data was gathered from MG between December 11th and December 13th 2012. Results. 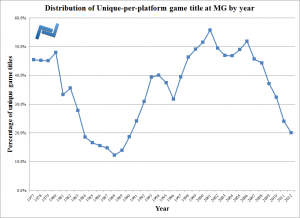 A total of 59936 game entries were found in the public MG database for 48 platforms selected for the time period of 1977 through 2012. Two peaks in yearly releases could be identified in 1990 and 2008. Out of the 59936 entries, the number of duplicate game titles was observed to be 33248 (55.47). The large majority of unique game titles at MG is associated with only 1 platform (20700 unique game titles, 62.26%), the list topped by Nintendo DS (63.4%), Atari 2600 (62.4%), Windows (60.6%), Nintendo DSi (59%) and GameBoy Advance (57.1%). The top 5 impact companies are Microsoft, Sony, Nintendo, Apple and Commodore. Though the number of games released for a Microsoft OS is dominating, the number of games released for the Commodore platforms (2nd most number of games for many years) has only recently been surpassed by Nintendo. Discussion. By far the most games have been released for Windows and DOS, and the market is still dominated by games running on a Microsoft OS. In the 1980s, 11 different companies were on the market of which Commodore was the most popular platform. Later decades showed the continued emergence of Nintendo, Apple and Microsoft OS, with Sony joining in 1994. To date those four companies define the market. The dynamics of games released for their platforms suggests different marketing strategies. The 1980s were dominated by games released for a multitude of platforms, while in the 1990s and early 2000s games were more unique to a platform. The last decade this has turned around back to a situation similar to the 1980s, most games released on multiple platforms. 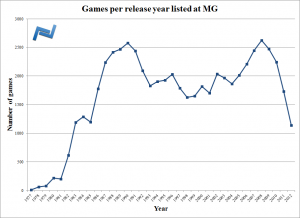 A dramatic decrease in the number of games released per year since 2009 indicates a possible issue at MG. Figure 1. Click to enlarge. 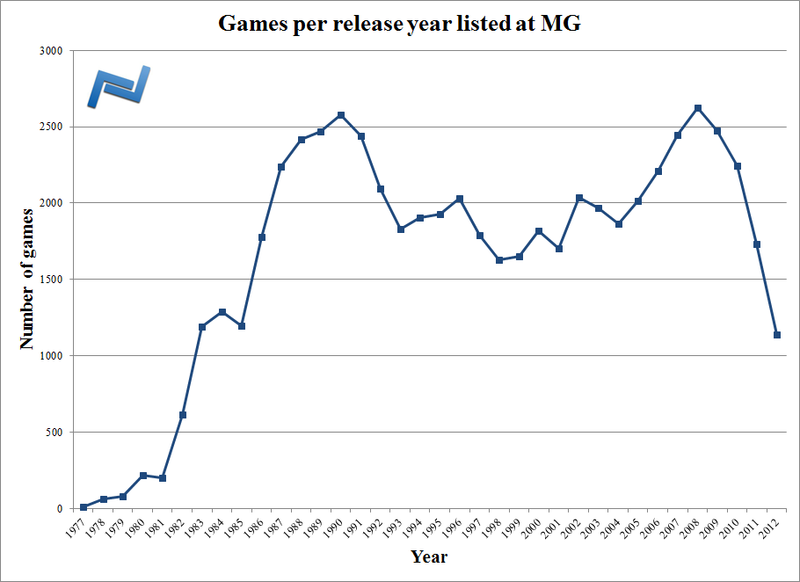 Number of games listed by release year at MG. Two high peaks are visible, in 1990, and in 2008. Figure 3 Click to enlarge. 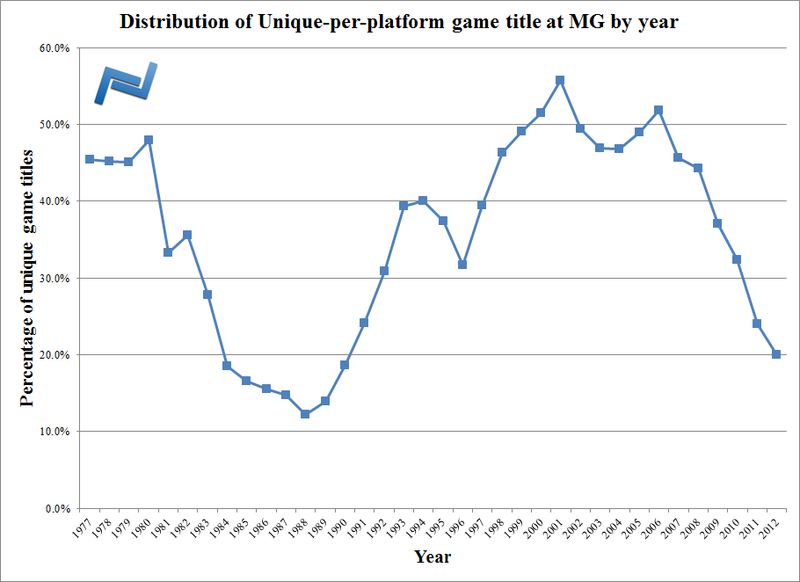 Percentage of unique game titles with only one platform at MG by year. 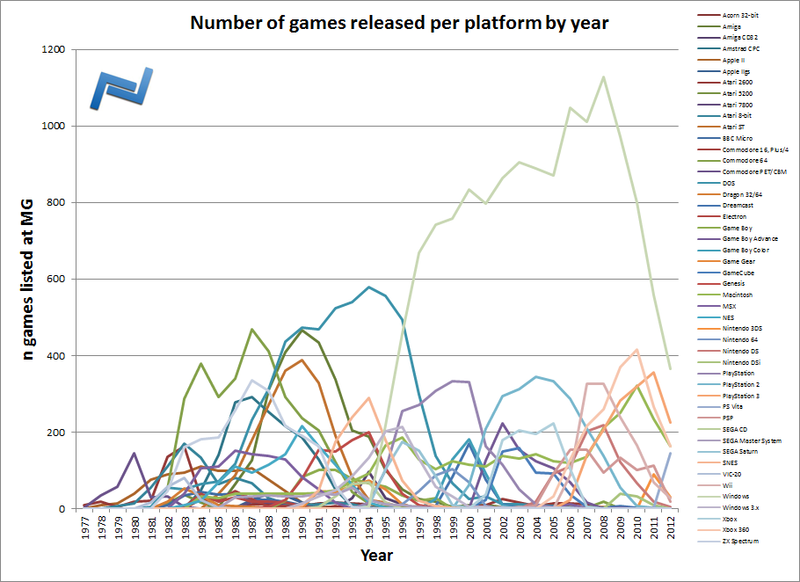 Note the 80s where most games were released on multiple platforms, and rise to more unique platform dedicated games in the decade after. The last few years there is a return to games released on multiple platforms. Figure 7A. Click to enlarge. 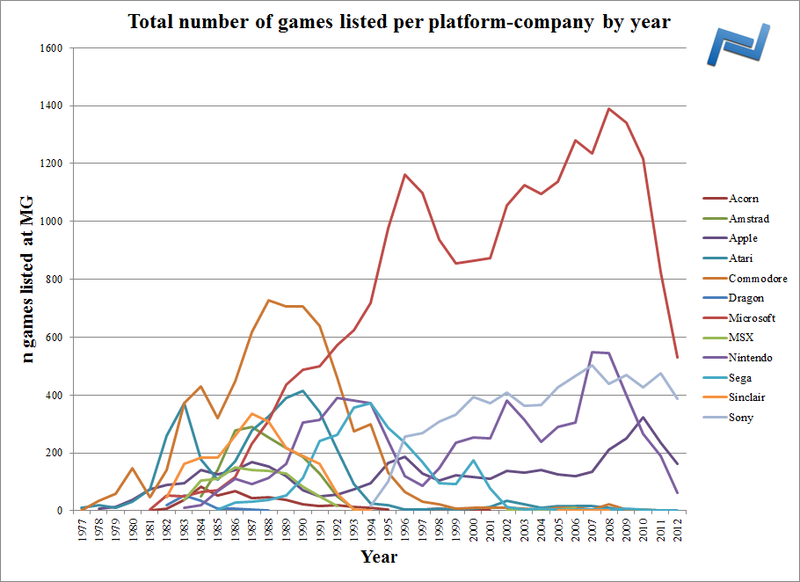 Number of games listed at MG by platform and year. Figure 10. Click to enlarge. 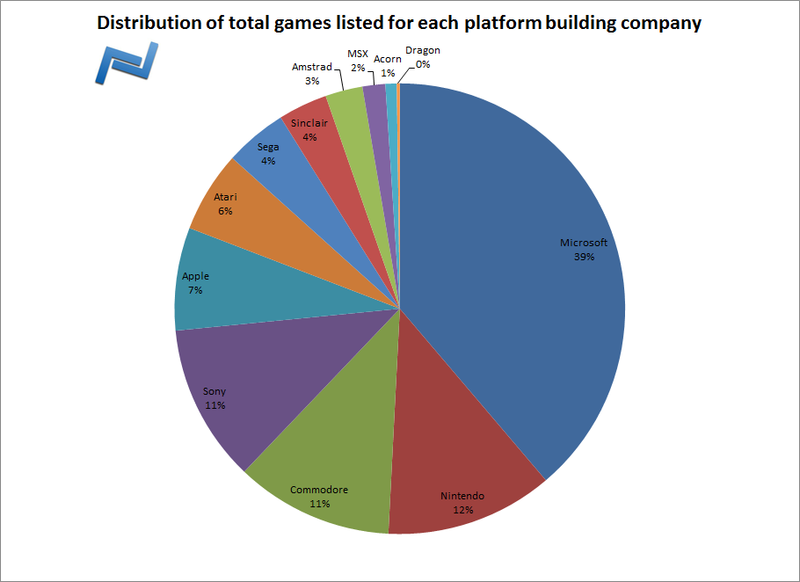 Total number of games released yearly on platforms created by 12 companies. Figure 12. Click to enlarge. The time periods where the bulk of games were released by platform-company. This entry was posted on Friday, December 28th, 2012 at 7:07 pm	and is filed under Blog, Game File Research, General. You can follow any responses to this entry through the RSS 2.0 feed. Both comments and pings are currently closed. I am a multi-platformer, each with it’s advantages and disadvantages. I just hope that developers can figure out a way to keep making money on the PC gaming industry. We are screwing ourselves with piracy. Wow, great article! At the MG we usually have simple stats done, but your analysis exceeds that. http://twitter.com/djgoldengorilla Jose O. Cuevas Jr. Awesome graph. i have not gotten into the game thing yet and this really helps to put things in perspective.